A 16-year-old male patient reported to the Department of Oral Medicine and Radiology with the chief complaint of painless swelling on the left side of face since 3 years which started with a pea size and gradually increased to attain the present size. There was no history of trauma, paresthesia, and difficulty in chewing food, and it was not associated with any other symptoms. Extraorally [Figure 1]a, a diffuse swelling (3 × 4 cm approximately) was seen, superoinferiorly starting from 2 cm below the infraorbital margin to the line joining the commissure and the ear lobe, and mediolaterally starting from the left side of nasal septum, causing obliteration of left nasolabial fold, to ramus of mandible on the left side, which was bony hard and nontender in nature. Intraorally, the swelling extended from 24 to 27 tooth region, with expansion of the buccal cortical plate and obliteration of vestibule. Overlying mucosa was smooth and it was bony hard and nontender [Figure 1]b. Provisional diagnosis of fibro-osseous lesion of left maxillary region was made. Teeth in the vicinity of the lesion were vital. Complete hemogram showed all the parameters were within normal limits. Serological investigations including serum calcium, serum phosphorus, and alkaline phosphatase (ALP) were also within normal range. Intraoral periapical (IOPA) radiograph [Figure 1]c of 24, 25, 26, 27 revealed loss of lamina dura around the teeth and a homogeneous ground-glass radio-opaque pattern in the periapical areas. Maxillary occlusal cross-sectional view [Figure 1]d revealed homogeneous, granular radio-opacity of left maxillary alveolar bone with expansion of buccal cortical plate extending from 23 to 27, giving a granular or ground-glass appearance. On the palatal side, homogeneous radio-opacity partially covered the greater palatine foramen. Margins of the lesion blended with adjacent areas. Orthopantomograph (OPG) and paranasal sinus (PNS) view [Figure 1]e and f revealed homogeneous granular radio-opacity on the left side of maxilla involving the maxillary sinus. Surgical recontouring of maxilla was done and histopathological examination revealed a connective stroma which was cellular and fibrous with plump cells. It was intermixed with bone of varying sizes and shapes confirming FD [Figure 1]g. The histologic features were suggestive of a fibro-osseous lesion. After the clinical features and radiological features were correlated, it was diagnosed as FD. A 26-year-old male patient reported to the Department of Oral Medicine and Radiology with the chief complaint of slowly growing painless swelling in the left upper back teeth region since 4 years. Extraorally, nothing was significant. Intraorally, the swelling started with the size of a pea and gradually increased to attain the present size over a period of time. There was no history of trauma, paresthesia, and difficulty in chewing food, and it was not associated with any other symptoms. On palpation, the consistency was bony hard and nontender and there was no local rise of temperature. The swelling involving the left maxillary alveolar bone extended from 24 to 28 with expansion of buccal and palatal cortical plates and obliteration of the buccal vestibule [Figure 2]a. Overlying mucosa appeared normal, firm, and was nontender. Teeth surrounding the lesion were vital. Provisional diagnosis of fibro-osseous lesion of left maxilla was made. Complete hemogram showed normal parameters except raised erythrocyte sedimentation rate (ESR). Serological investigations including serum calcium, serum phosphorus, and ALP were within normal range. IOPA radiograph [Figure 2]b of 24, 25, 26, 27 revealed loss of lamina dura around 24, 25, 26, 27 and a homogeneous granular radio-opaque pattern in the periapical areas. Supraeruption of 26 was also seen. Maxillary cross-sectional occlusal radiograph [Figure 2]c revealed homogeneous, granular radio-opacity of left maxillary alveolar bone with expansion of buccal plate extending from 23 to 27, giving a granular or ground-glass appearance. Margins of lesion blended with the adjacent areas. OPG and PNS view [Figure 2]d and e revealed homogeneous granular radio-opacity causing obliteration of the maxillary sinus. OPG also revealed that 26 was present below the occlusal line with proximal caries. The lesion was surgically excised and histopathology of the excised tissue showed a benign fibro-osseous lesion formed by a hypercellular fibroblastic stroma consisting of spindle cells arranged in whorls with storiform pattern and also in loose sheets with intervening collagen. Among these was immature woven bone with Chinese letter configuration. These features were suggestive of FD [Figure 2]f.
FD is commonly a benign lesion in which irregularly distributed spicules of bone lie in cellular fibrous stroma. The lesion is believed to be hamartomatous developmental abnormality of bone. FD is essentially a disease of young population with incidence of 1:4000 to 1:10,000. Bones of face and skull are frequently involved, resulting in asymmetry and spontaneous fractures. Craniofacial structures are involved in 10% of monostotic type, 50% of mild polyostotic cases, and 100% of severe polyostotic cases. Maxilla and mandible are commonly affected with the temporal bone involved in 18% of cases. Its onset is usually insidious, although recurrent bone pain is the most common presenting skeletal symptom. But, in contrast, this feature was not present in the cases presented here. There is an evidence of bowing, and deformity or thickening of long bones, often unilateral in distribution. FD of craniofacial complex may differ both radiologically and histologically from its counterparts in the axial skeleton. FD appears frequently in axial as a circumscribed radiolucency with thin sclerotic periphery, whereas cases of craniofacial FD, especially those affecting the jaws and adjacent bones, are poorly defined and more radio-opaque. A reason for the difference in appearance between maxillofacial FD and FD of long bones is that the former occurs in skeleton derived from membranous bone. Fries has described three radiological patterns in craniofacial FD. , The first is pagetoid or ground glass with bone expansion and alternate areas of radiodensity and radiolucency. It occurs in more than half of the patients, most of whom are older than 30 years of age and have had symptoms for an average of 15 years. The second pattern is sclerotic, with bone expansion and a homogenous radiodensity. The third type is cyst-like, usually a round or oval lesion with a sclerotic border. The sclerotic and cyst-like patterns occur in younger individuals (age below 20 years). Other features include fingerprint bone pattern, orange peel appearance, and superior displacement of mandibular canal in mandibular lesion. Skeletal radiographic features include "shepherd's crook" deformity of femoral neck and "bowing deformities" in weight-bearing long bones. Mahadesh J, Gowda C, Devi L, Kokila G. Fibrous dysplasia of the jaw bones: Clinical, radiographical and histopathological features. Report of two cases. J Dent Sci Res, 2011;2:18-25. Agarwal MM, Balaji N, Sumathi MK, Sunitha JD, Dawar G, Rallan NS. Fibrous dysplasia: A review. TMU J Dent 2014;1:25-9. Canýtezer G, Gunduz K, Ozden B, Kose HI. Monostotic fibrous dysplasia: A case report. Dentistry 2012;3:1-4. Harri SWH, Dudley RH Jr, Barry RJ. The natural history of fibrous dysplasia. An orthopaedic, pathological, and roentgenographic study. J Bone Joint Surg Am 1962;44-A:207-33. Cholakova R, Kanasirska P, Kanasirski N, Chenchev, Dinkova A. Fibrous dysplasia in the maxillomandibular region - Case report. J IMAB 2010;16:10-3. Crawford LB. 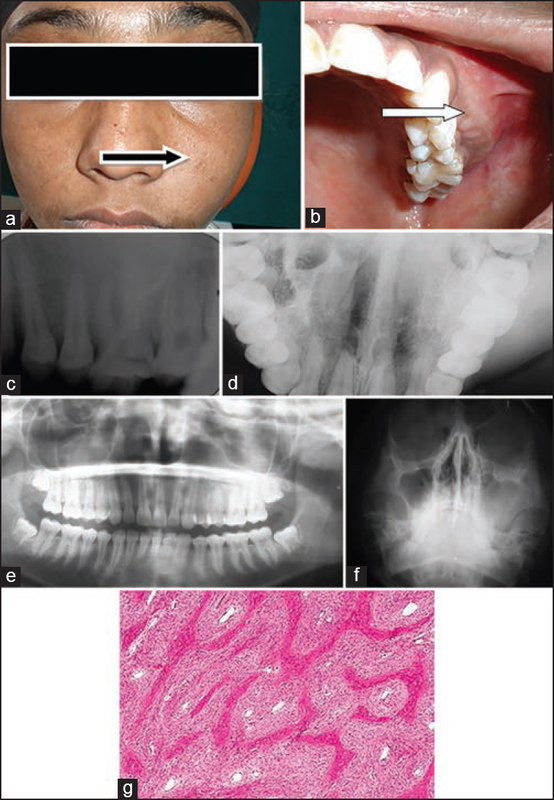 An unusual case of fibrous dysplasia of the maxillary sinus. Am J Orthod Dentofacial Orthop 2003;124:721-4. 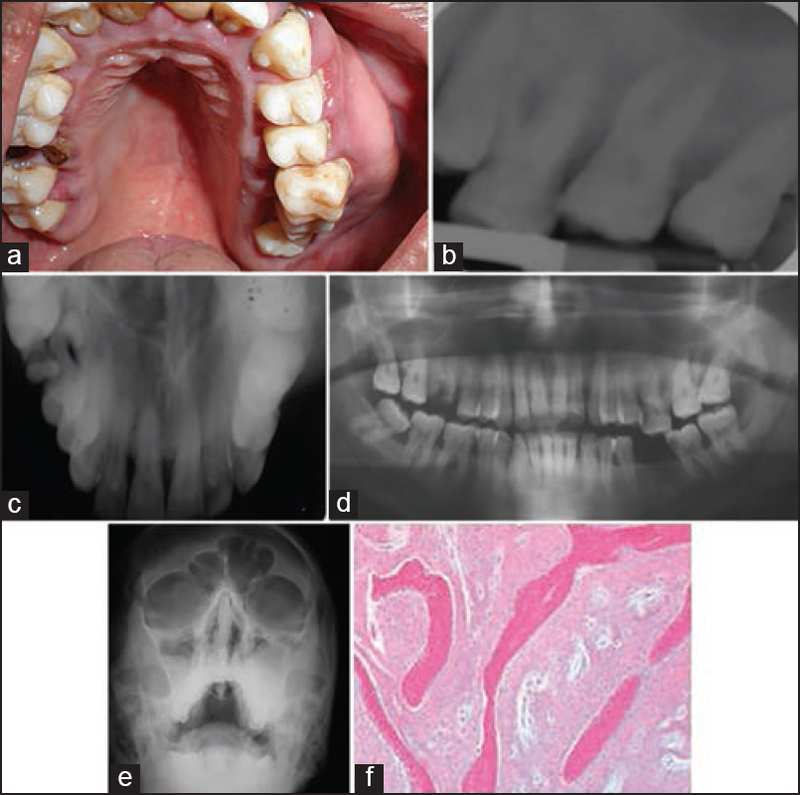 Ganapathy N. Fibrous dysplasia of jaw: A case report and update on pathogenesis. JIADS 2011;2:54-6. MacDonald-Jankowski DS. Fibro-osseous lesions of the face and jaws. Clin Radiol 2004;59:11-25. Fries JW. The roentgen features of fibrous dysplasia of the skull and facial bones; a critical analysis of thirty-nine pathologically proved cases. Am J Roentgenol Radium Ther Nucl Med 1957;77:71-88. Gursoy B, Arslan A, Altundal H, Olgac V. Fibrous dysplasia of the mandible: A case report. Oral Health Dent Manag 2004;3:185. Gupta S, Umesh K, Warad NM, Ahmed S. Fibrous dysplasia of maxillary bone: A case report. Al Ameen J Med Sci 2011;4:92-7. Shreedhar B, Kamboj M, Kumar N, Shamim Khan S. Fibrous dysplasia of the palate: Report of a case and review of palatal swelling. Case Rep Pediatr 2012;2012:179853.